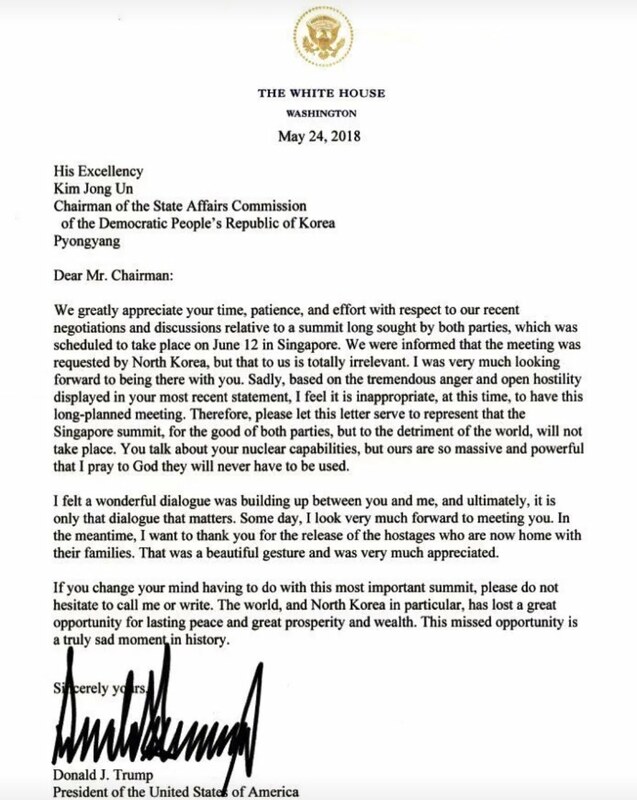 I greatly appreciate your time, patience, and effort with respect to my recent request that you don’t get President Donald Trump impeached before the summit between the US and North Korea, which was scheduled to take place on June 12 in Singapore. In return, I invited you to visit Singapore as my personal guest. I was informed on Thursday that the meeting was cancelled by Mr Trump in a letter to Mr Kim Jong Un. There’s still hope. Fingers crossed. Although I understand that some Singaporeans were relieved when they first heard news of the cancellation. And groaned again when it was reported that the White House was still sending a team here to prepare for the summit. It’s like this year’s National Day Parade organisers. They can’t decide whether they want a new National Day song or not. So we have half a new song instead. But even if the summit doesn’t happen, I still want something to remember these few weeks of will-they-won’t-they by. That was why I went to the White House Gift Shop website to order the commemorative summit coin featuring “raised silhouettes of President Donald J. Trump and North Korea's Supreme Leader Kim Jong-un”. But I balked when I saw that shipping to Singapore costs US$60.50. That’s more than three times the cost of the coin itself! I’m not a “billionaire” like Mr Trump, you know? I was very much looking forward to you being here in Singapore with me. Sadly, based on the tremendous uncertainty and open dithering displayed in your President’s most recent statement, I feel it is inappropriate, at this time, to have your long-planned visit to Singapore. The thing is, even if you don't get Mr Trump impeached before June 12, the summit could still be called off. Therefore, please let this letter serve to represent that your visit to Singapore, to the detriment of both parties, but for the good of my marriage, will not take place. You talk about spanking Mr Trump with a rolled-up copy of Forbes magazine with his picture on the cover, but our caning is so massive and powerful that I pray to God it will never have to be used on me. Ask Michael Fay. I felt a wonderful dialogue was building up between you and me, and ultimately, it is only that dialogue that matters. Someday, I look very much forward to meeting you as well as Thunder and Lightning. In the meantime, I want to thank you for the release of your movies even though we in Singapore aren’t allowed to see them. That was a beautiful gesture and was very much appreciated. If I change my mind having to do with this most important visit, I will not hesitate to call you or write. Singapore, and myself in particular, has lost a great opportunity to see Your Storminess in the flesh.